Spa Bella specialty skin care products are now available through our online boutique! Here you will find an extensive range of prescription strength skin care products to help manage and rejuvenate the youthful appearance of your skin. We stock a wide spectrum of highly active and extremely effective products that target the aging process, acne, dark circles and more. 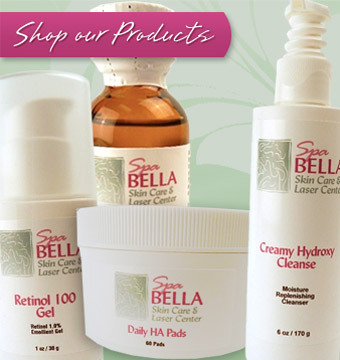 Spa Bella's products are designed to complement and enhance our laser and surgical procedures as well. If you’re looking for that revolutionary breakthrough to better skin, look no further than Spa Bella’s online boutique. If you don't see a specific product online or if you are outside of the U.S, please call Spa Bella at 301.567.6767 for assistance. And remember, whatever the occasion, a gift certificate to Spa Bella is the perfect gift. Plus, our online boutique makes shopping quick and easy. Unlimited use from 1/1/19 until 12/31/19. Our SpaBELLA Membership Card is the gift that keeps on giving. If you are purchasing as a gift, please include the recipient's name under "Order Comments" in the checkout screen for us to personally print for you. Otherwise, we will print the purchaser's name on the card. 2018 Cardholders renewing your membership? Call the office to get your $25 off discount CODE. 2017 and 2016 Cardholders renewing your membership? Call the office to get your $50 off discount CODE. 2016,2017 and 2018 Cardholders renewing your membership? Call the office to get your $75 off discount CODE. 2015-2018 Cardholders? Call the office to get your FREE membership card. Brightening Pads are hydroquinone-containing pads for the treatment of melanoma and post-inflammatory hyper pigmentation in the form of convenient, easy-to-apply pads. Best suited for treating broad areas of hyper pigmentation on the face, chest, arms, legs and hands. Retinoid-free and steroid-free, the formula contains Hydroquinone in a vehicle incorporating Kojic acid, Salicylic acid and Vitamin C.
C+E Ferulic Serum contains high-potency anti-oxidants combined with a hydroxyacid, providing both short-term cutaneous micro-exfoliation and longer-term skin firming and protective benefits. The anti-oxidant mixture consists of Vitamin C ester supplemented by Vitamin E and Ferulic acid ester. The elegant serum is suitable for oily / combination complexions. Shade Factor Anti-oxidant Facial Sunscreen SPF 30 is a combination of micronized Titanium and Zinc oxides, fortified with the powerful anti-oxidant Melanin, Vitamins C, E and Ferulic acid ester, in an anhydrous silicone-based gel. With a silky rub-in and matte finish, Shade Factor leaves no shine, no stickiness and no odor on the skin. The inert, fragrance-free, preservative-free vehicle is ideal for patients with sensitive skin, or post-treatments that leave skin dry or irritated. A light tint is added to this formula to even out skin tone or to use as a primer for foundation.